Mount Everest, perhaps mother nature’s crown jewel, is the tallest mountain in the world (above sea level), standing at an impressive 29,092ft in the Eastern region of the Himalayas. The mountain was formed over 60 million years ago by colliding tectonic plates and for some, it is a life-long goal to stand on the top of a mountain that was once believed to be unclimbable. Mount Everest is rising 4mm every year, that’s 40cm each century due to the tectonic plate movements continuing to force the Himalayas up. While there is only one summit, there is actually 7,000 peaks on Everest. Climbing Mount Everest is no easy challenge. It’s a mental, physical and financial experience. It costs a minimum of £50,000 to climb, with the permit alone costing at least £17,000. Climbers cannot climb the beast without gear, and good gear too. The cost of transport, guides, gear, and training comes to an enormous sum. The mountain takes around 10 weeks to climb as all climbers must go through acclimatisation when above base camp. They’ll hike up and down the mountain going up slowly and when the weather is clear they can make a punt for the summit. The first person to ever reach the top of Mount Everest was Edmund Hillary from New Zealand in 1953, who was accompanied by a Nepalese Sherpa, Tenzing Norgay. On May 29th, 1953, at 11:30 am the two climbers stood on top of the world. Since then, over 4,000 people have stood on the summit of the tallest mountain in the world and a number of climbers have climbed more than once. The record number of climbs is by Apa Sherpa, a Nepalese mountaineer who has stood on the summit a staggering 21 times! The youngest person to ever reach the top was a 13-year-old girl from India called Malavath Poorna in 2014. Mount Everest has a death rate of 4% although this is slowly reducing due to weather predictions and climbing equipment becoming more advanced. It is estimated that over 290 people have died while on Everest, most of which actually occurred during the descent, due to the dangers of avalanches, falling into crevasses and altitude sickness. Most bodies are left on the mountain and are actually used to help people along the route. There are thought to be over 200 bodies still on the mountain. Mount Everest is no easy challenge. It often requires a lifetime of preparation and getting to base camp alone is hard work. From 17,000ft up the mountain, it is covered in snow and ice. These conditions can cause snow blindness which is why all climbers wear goggles. Snow blindness is a temporary loss of vision due to UV ray exposure – your cornea literally gets sunburned! The very top of Mount Everest is what is called the ‘death zone’ because from 26,200ft and upwards there is a significant lack of oxygen in the air. This is the height of a cruising 747 – the human body is simply not designed to survive at such an altitude. Temperatures on Everest can drop to -60 degrees Centigrade and wind speeds have been recorded at over 200mph. At this highest point, humans are taking in around a third of the oxygen compared to on ground level, making every move their body makes so much harder. This is why most people who attempt the climb turn back, due to exhaustion. On summit day climbers will burn a staggering 20,000 calories and on every other day up to 10,000 so climber’s diets need to be filling! 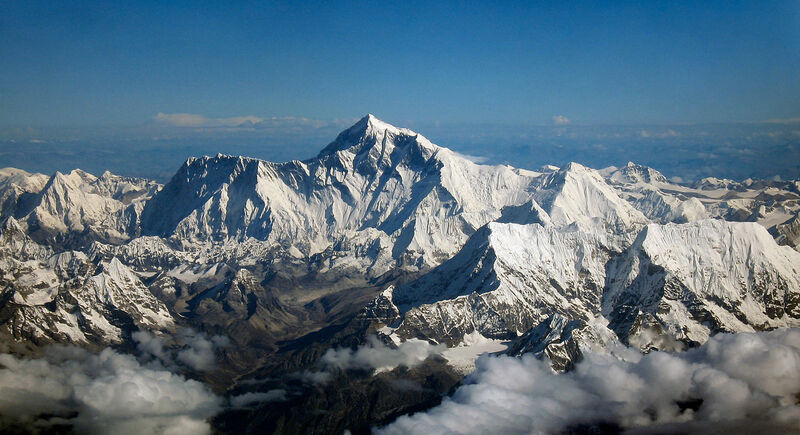 Mount Everest isn’t technically the tallest mountain on our planet. That award goes to Mauna Kea in Hawaii. The total height of this mountain is 33,500ft that is nearly a mile taller than Everest. However, 19,700ft Mauna Kea is underwater and so Mount Everest is technically only the world’s tallest mountain, above sea level. To put the height of Mount Everest into context, imagine 643 double-decker buses stacked on top of each other – or the height of 23 London Shards! Climbing the mountain wouldn’t be possible without the hundreds of Sherpas to carry gear and guide the international climbers. Sherpas have been described as genetically adapted angles for the mountains. They lay 33,000ft of fixed rope each year to the South Col route alone, and there are 18 different named climbing routes on the mountain from the south-east ridge in Nepal or the north ridge from Tibet. Mount Everest is a fascinating monster that is still growing and will continue to be one of the World’s most famous landmarks for many years and remain a challenge that many will never overcome.